In this post we will show you how to store and retrieve files in the remote file server using UNC path. UNC is a naming convention used to specify and map network drives in Microsoft Windows. You need to have two server FileServer and WebServer. You also need admin rights for both the servers. In both the server you have to create a user with the same username and password. Lets say, UserName : TestUser, Password = pwd. Now in IIS you have to Edit permissions of your Website as shown below. Now on the Security Tab, add TestUser and give all the permissions (Full Control, Modify. Read & execute, etc..) to that user. In the FileServer create a Folder (TestFolder) and share that folder with the newly created user (TestUser). After sharing you will get a path as //YourComputerName/TestFolder (so called UNC path). 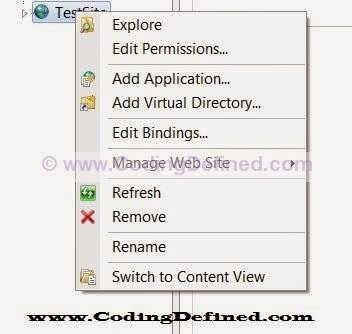 Now implement impersonation in Asp.Net as shown below. 1. Could not load file or assembly or one of its dependencies. Access is denied. To fix this you have to add permissions (newly created User's) to the "Temporary Asp.Net folder"